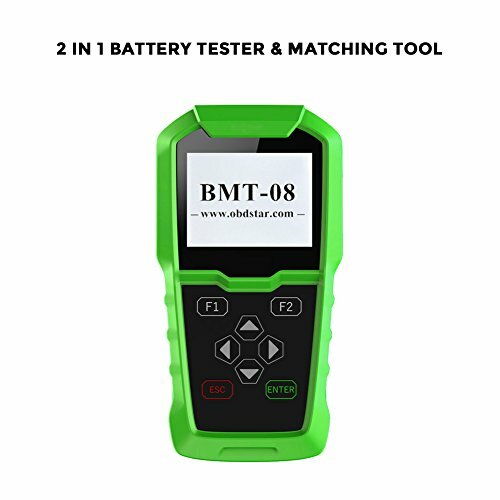 Newly released from OBDSTAR, BMT-08 Battery Analyzer is specialized in battery test and battery matching, adopts the conductivity test technology, it can quickly detect the battery condition and the malfunction in vehicle start-up system and alternator charging system, which can be widely applied to after market, auto repair shops, auto technicians, individuals. ➤LARGE LCD SCREEN: BMT-08 battery tester is well built with a 2.8inch LCD display that has white backlight and contrast adjustment, indicates test results directly. no internal batteries required and gets the power directly from the 12V battery. If you have any questions about this product by Obdstar, contact us by completing and submitting the form below. If you are looking for a specif part number, please include it with your message.